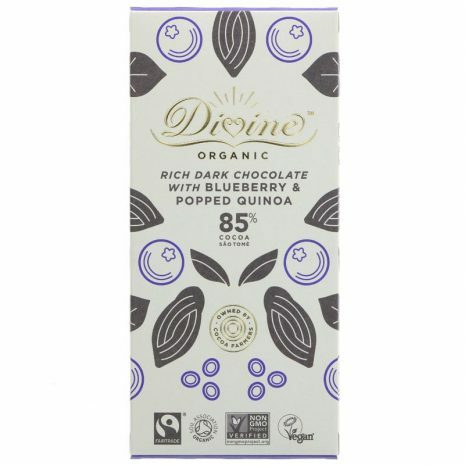 Bite down and enjoy the luscious taste of 85% dark chocolate with this delectable Divine chocolate bar. Made by experts in Germany, this chocolate not only has a bold taste, but also a delightful texture with a slight touch of fruitiness. The ingredients are all organically grown to create the most natural taste possible; leaving out all of the nasty chemicals. The recipe is made to create a delightful treat that is also vegetarian and vegan friendly. Ingredients come from fair trade sources, earning each bar official FairTrade label certification.